Joseph Bernard Banaszak, 79, of Crivitz, passed away unexpectedly on January 26th, 2019 at home. Joe was born in Beaver to Simon and Margaret (Denowski) Banaszak on March 26, 1939. He was a graduate of Coleman High School and then enlisted in the US Navy. He married LoisRae Smith on August 17, 1963. He worked for his father’s business, Banaszak Chevrolet, for over 40 years and was the owner of the dealership for 20 years until he retired in 2002. 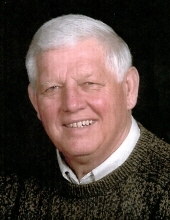 He was an active member of the community and volunteered as an EMT on the Crivitz Rescue Squad for 22 years, was a Supervisor for the Town of Stephenson for four years, Marinette County Supervisor for six years, and manager of the Crivitz Airport for five years. He was a 4th Degree Knight of the Knights of Columbus for over 50 years, a member of the St. Vincent De Paul Society, and the American Legion, Netzel-Zenz Post 413. Joe is survived by his wife of 56 years; LoisRae; two sons: Jeff Banaszak (Lynelle) and Tim Banaszak (Sandi); five grandchildren: Austin, Mitchell, Brookelyn, Brock, and Bryce; three siblings: brother Elmer (Donna) and sisters Alice (Harry) Tomaszewski and Shirley Effinger; and 20 nieces and nephews. Joe is preceded in death by his parents, his brother Ernie and sister Virginia Richlen. He enjoyed fishing, hunting, golfing, spending time outdoors riding on his tractor and planting trees on his land. He had a passion for automobiles and aviation. He was a private pilot and owned a Cessna 172 for many years. Most of all he loved his family and enjoyed spending time watching his grandchildren play hockey, basketball, and volleyball. Family will greet relatives and friends Saturday February 2 at the Rhodes-Charapata Funeral in Crivitz 8:00 a.m. until going to St. Mary’s Catholic Church for Funeral Mass of Christian Burial at 12:30 p.m. Rev. Walter Stumpf officiating and burial in the St. Mary’s Cemetery Military Rites will be held at the Cemetery by American Legion Post 413. In Lieu of flowers, a memorial fund will be established for Knights of Columbus. To send flowers or a remembrance gift to the family of Joseph Bernard Banaszak, please visit our Tribute Store. "Email Address" would like to share the life celebration of Joseph Bernard Banaszak. Click on the "link" to go to share a favorite memory or leave a condolence message for the family.